There are 4 ways to change the view scale of the sources, preview or frame sequence. As described in Lesson 4, there are 3 view tools on the toolbar. 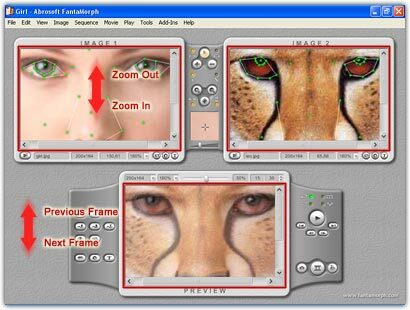 Choose the tool Zoom In ( ) or Zoom Out ( ) and click anywhere of the source images or preview, the viewport can be smoothly scaled from 12.5% to 800%. Choose the tool Adjust Viewport ( ) and drag the viewport by mouse or use the scroll bars to show a needed part of the window. There is also a Magnifier on the toolbar that magnifies the area under and around the mouse cursor when you are working within the source or target image. Besides, you can drag the Magnifying Power Slider to change the magnifying power, or directly press the key "N" to decrease or "M" to increase the magnifying power. You can simply drop down the view scale list on the sources and preview window, then choose a suitable item. Beginning with version 3.0, using mouse wheel scrolling is allowed, this makes some operations more quick and comfortable. Move the mouse cursor to a desired position inside the sources or preview windows, then roll the mouse wheel up to zoom out or roll the mouse wheel down to zoom in. It is also a fast way to change the view scale of the sources and preview when your mouse has no wheel. Press the key "," to zoom out the current viewport under the cursor, press the key "." to zoom in, or press the key "/" to set the view scale to "Best Fit". Particularly, when you working on Frame Sequence view mode, press the key "," will decrease the frame thumb size, press the key "." will increase the frame thumb size, or press the key "/" to fit all frames to only one page if possible.